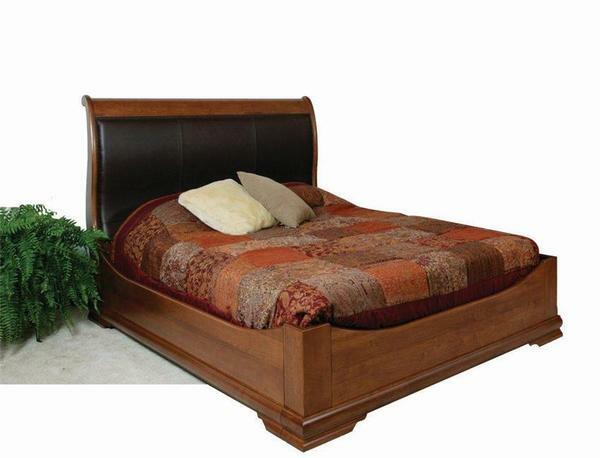 Sleep like royalty in our handmade Williamsburg Sleigh Bed. Inspired by a timeless style, the curved headboard and elegantly sloped, sleigh platform make this bed a brilliant centerpiece for any bedroom suite! The headboard offers a graceful curve that is covered with a genuine leather panel, perfect for sitting up in bed at night while adding depth to your bedroom decor. Build your room around this handcrafted bed and you're sure to have a beautiful piece that can be handed down and enjoyed for many generations to come. Choose from an array of sizes to find a bed to fit your space. Follow it up with your favorite hardwood and finish combination to match your decor and your handcrafted bed will soon be on its way. Shown with a black leather headboard panel, this bed can also be customized with different colored leathers to make this bed your own. Call an Amish Furniture Specialist today to start your order by phone, request stain samples or request a free custom quote.